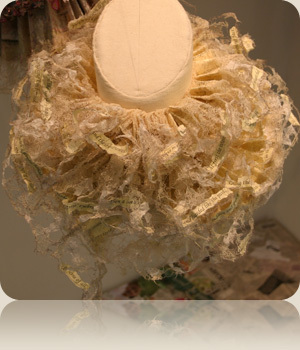 I graduated in 2007 with a Diploma of Higher Education in Stitched Textiles (Distinction). 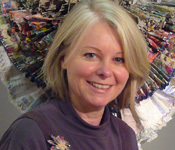 Awarded the Embroiderers Guild Scholarship 2009-10 and in 2012, nominated as a Member of the Society of Designer Craftsmen. My work is seen in many publications and magazines. I am a visiting tutor at West Dean College, Chichester and have had invites to exhibit and teach both nationally and internationally. I have an avid interest in stitched textiles which now spans over 20 years. 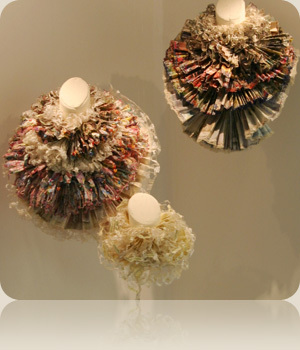 I originally achieved City and Guilds part I/II in 1995 and in 2003 was selected to exhibit a piece of work, an elaborate and brightly coloured handbag, at the Victoria & Albert Museum. During the 3 year Diploma course I pursued an interest in lace and edgings. When deciding the subject for my final exhibition piece, I conceived the idea of combining the formality of Elizabethan ruffs with Shakespeare’s speech ‘the seven ages of man’ from his play ‘As you like it’. 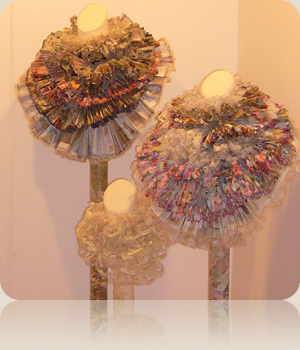 I further developed this concept and created three light-hearted pieces to form a theatrical Trinity of Ruffs – man, woman and child – it is a modern-day interpretation using a unique manipulation of stitch and scraps of printed matter trapped into a crusty lace-like fabric. Each ‘age’ is interpreted by the use of pages from magazines depicting the influences, developments and interests as we mature. For example, sections from comics for the schoolboys, girly magazines for the young men/lovers; Financial papers for the business man through to weather reports and crosswords for retirement...finishing with the obituaries page! Similarly, the Ladies ruff contains abstracts from glamour, careers, brides, and housekeeping magazines. The small ruff which completes the formal portrait contains the words written by Shakespeare intertwined within the lacy paper fabric. Together, these large pieces are purely installation art and have been a surprising talking point with a lot of ‘wow’ factor as they draw the viewer for a closer look, as the pieces have a lot to say about the comical and fun side of life. My work developed producing ‘The Circle of Life’ series; a collection of wall hangings/pictures continuing with the same technique and story. Due to the different reading matter between the ages and sexes the work has its own personality and identity; the tale is further embellished with the use of beads, buttons, baubles and toys. In 2008 ‘Businessman’ was shortlisted by the Royal Academy for the Summer Exhibition. My ‘Celebration’ series is a selection of work celebrating significant moments in one’s life such as a Christenings, anniversaries or special birthdays. Presently this work is displayed in high quality bespoke wall mounted Perspex boxes; I now take commissioned work which can be personalized with relevant names and dates making it a very individual piece of contemporary textile art. All venues for future and past shows are on my Exhibitions page.